The program allows to find candle combinations, which is the most similar to the selected one, in past and make a forecast basing on these parts of the chart. Working with this application is easy - select interested bar sequence on the chart ("sample"), and the program will find parts on the chart similar to this sequence ("patterns") and apply them on current prices. This is a free and absolutely functional version. Works on symbols which have "EURUSD" in their names. You can purchase paid version which can work on any instrument. Finding vector magnitude plotted between the "sample" and the sought "pattern" in multidimensional space (Distance). The smaller the module is (min 0), the more similar the "pattern" and the "sample". Finding Pearson correlation coefficient between the "sample" and the sought "pattern"(Pearson's r). The bigger the correlation coefficient is (max 1), the more similar the "pattern" and the "sample". Relatively to the open price of the "sample's" first bar. Relatively to mathematical expectation of the "sample". For accounting "patterns'" volatility if you choose the second method, and to accelerate search if you choose the first method, you can set a minimum ratio of the "sample" standard deviation to the "pattern" standard deviation (Min. SD ratio). The closer this ratio to 1, the less different standard deviations of prices of the "pattern" and the "sample". Total number of the most similar "patterns", remembered by the program during the search. Pointer to the current bar. Shows the first bar of the "sample". 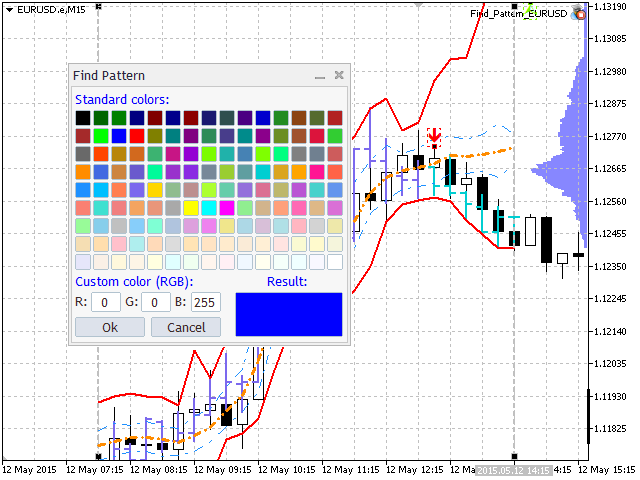 When the program searches "patterns", it accounts the open price of that bar only. Open, high and low prices are accounted for other bars. High and low price line. These are the highest high price and the lowest low price among all found prices. Average price line. Drawn according to open, high and low price. The "Color settings" menu offers an ability to select color for all elements displayed on the chart. You can also select width and type of lines. The "Result" menu offers an ability to move to found "patterns" to scrutinize them. Values of all defining readings are also displayed. You can eliminate any found "pattern" from the forecast if you did not like it for some reason. The program remembers all settings and automatically uploads them when loading. 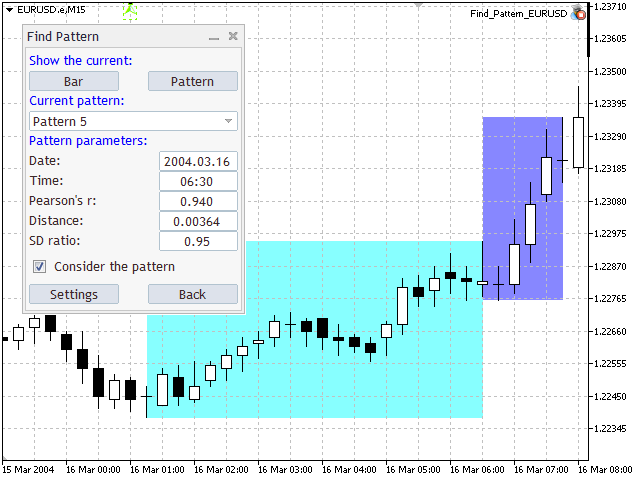 The program settings are stored separately for each symbol and period in the folder "MetaTrader 5\MQL5\Files\FindPattern". If you need to revert to original settings of the program, remove the folder "FindPattern". It has to be understood that even if the price behaved in a certain manner dozen times, it does not mean that it will be behaving likewise. 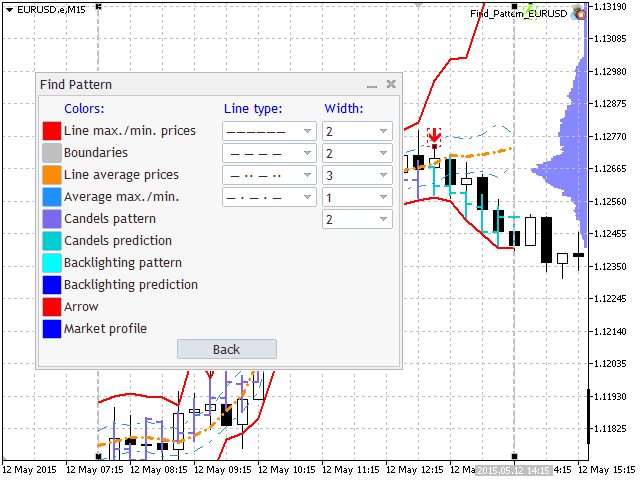 Use the mentioned tool as a supplement to your trading system and for checking signals of other indicators. Do not make decisions on opening a position relying upon its recommendations only. The program does not redraw its readings and cannot dip into the future. It allows to test it right on the chart. Deep quote history is required for qualitative operation. in Market: 1, 2, 3, 4.
in Code Base: 1, 2, 3, 4, 5.